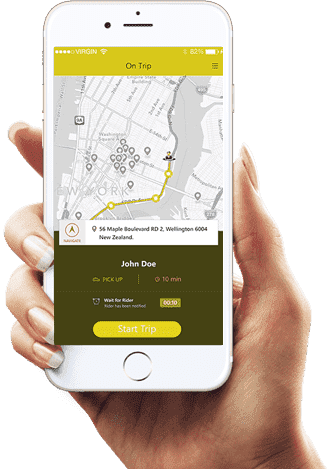 Dedicated Taxi Driver App for handling ride requests depending upon convenience and availability. Any registered driver can pick up riders from their locations at requested time. Whenever any passenger requests a ride, the very nearby driver will be instantly notified. If ready to take ride, the driver can accept or reject the request after viewing customer rating and reviews. GPS enabled navigation system lets you take the passenger to requested location easily. Once the passenger has been dropped safely at the destination, driver can close the trip. Fare is estimated and payments are done automatically in a weekly basis to the driver account. Easy registration and login interface. Email / Mobile verification for ensuring security. Go Online / Offline button. Individual driver profiles with driver and taxi information. Track driver movements through GPS. Push notification facility for accepting the ride request when app is in minimized state. Driver can accept / reject the ride request based on the passenger rating. Call functionality to the passenger, once the trip is accepted. Google / iOS navigation during the trip. Fare meter for showing the fare and time on ride. Cancel the trip anytime by the driver. Rate the passenger after the successful trip. Trip history with complete route map. Unique trip id will be used for record tracking.